It may seem like a peculiar tradition to most: Take it easy on New Year’s Eve, so you’re ready to party on the 1st. That’s exactly what happens in Philadelphia, which marks each revolution around the sun with the fanciful, fantastical, unbelievable Mummers Parade. Don’t get me wrong — on the 31st, Philly sparkles and shines (thanks to two fireworks shows) and throws down (thanks to parties all over the city). 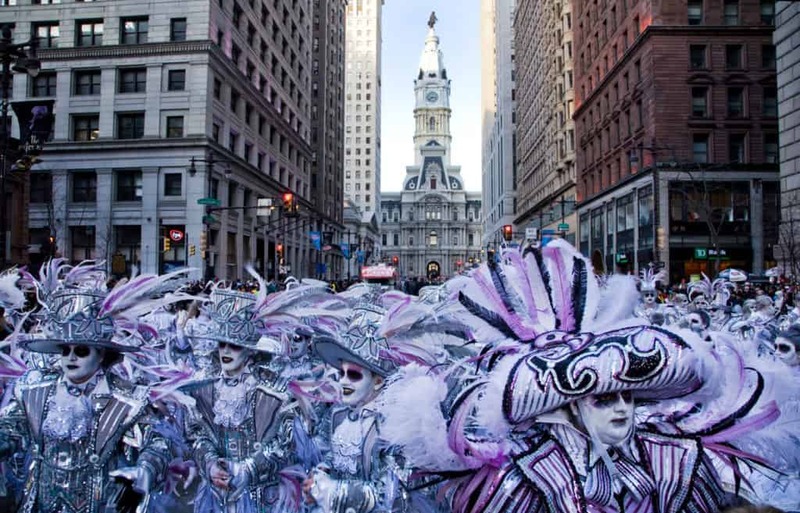 But on New Year’s Day, the Mummers make Philadelphia the best place — the only place — to be. 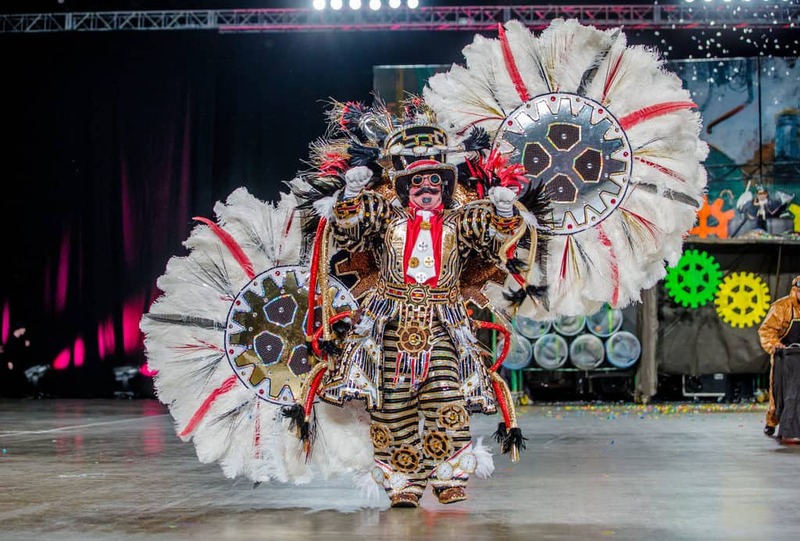 Picture it: 10,000 men and women painting their faces and donning bedazzled costumes to march through the city — dancing and performing all the way. Men in dresses and makeup. Women with mustaches and beards. Boas, sequins, feathers, confetti. And it’s not even Pride. I know, it can be confusing if you’ve never been there. There are five Mummer divisions: Comics, Wench Brigades, Fancies, String Bands, and Fancy Brigades. Each division offers its own specialty, such as music, theatrics, satire or just plain revelry. Inside those divisions, smaller clubs consist of anywhere from a few dozen, to a few hundred, people. Each member is a Mummer. Mummers’ backgrounds vary, but generally, these are neighborhood people. Working class guys and gals who consider it their civic duty, personal responsibility and ultimate pleasure to ring in the New Year for thousands of cheering, adoring fans who count on them to start it off right. They practice, fundraise, choreograph, sew costumes and build sets all year long for this one day. And trust me, they deliver. From morning until evening, the different clubs make their way along downtown Philadelphia’s east-west dividing thoroughfare, Broad Street. At various points, they stop to perform a routine, each one depicting a different theme. You read that right. It’s a day of theme parties. The themes can be clever or goofy or provide commentary on current events. Philadelphians love seeing each new theme played out. Many of them can provide insight into how the theme varies from the previous year, or the year before that. Or how it’s similar to another club’s theme, and how those two clubs have been longtime rivals, because the one club’s banjo player used to be a member of the other club. Mummery is not just an event; it has its own culture and represents a huge part of Philly’s culture. 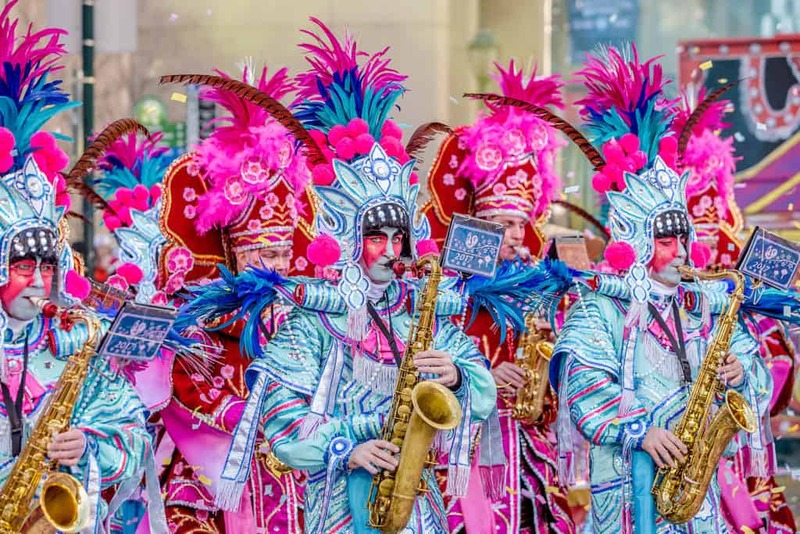 The Mummers Parade is a daylong affair. It steps off at 9:00 a.m., and it continues down Broad Street, eventually winding down sometime around sunset. City Hall is a judging area (did I mention that they’re competing for a prize? ), so it’s an excellent viewing spot, though you need to reserve tickets in advance. The rest of us non-planners should arrive early and set up near a performance spot, where the colorful and talented String Bands wow the crowds. They’re located along Broad Street at Sansom Street (near the Gayborhood!) and Carpenter Street (ditto!). The Comics and Wench Brigades, which stroll through on the earlier side of the day, love snapping pictures with their fans. They’ve been known to smooch on request too, so put that on your bucket list. If/when you go, bundle up. And then bundle some more. Standing outside can get very chilly, no matter how many Miller Lites you bum from the group next to you. 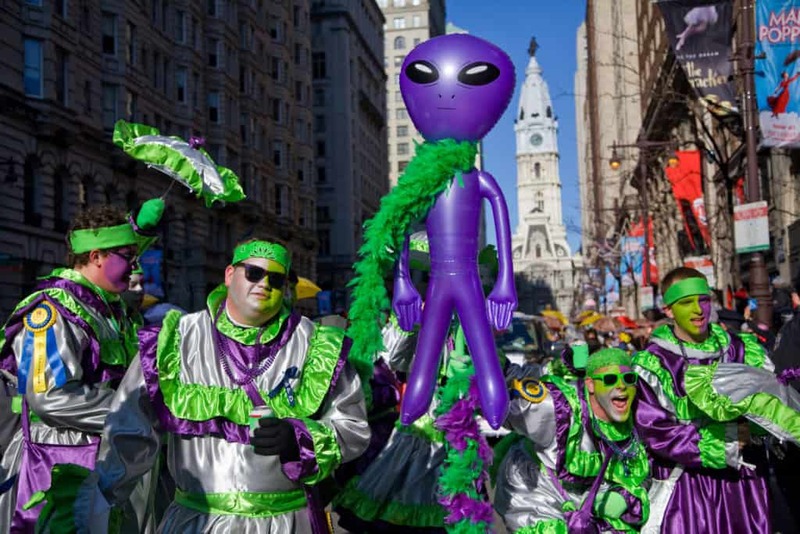 Plan your trip to Philly for the see-it-to-believe-it Mummers Parade ahead of time and book a room here. If you can’t make it this year, get a primer by watching it stream live New Year’s Day on Phl17.com.